A simple ready to do project for a beginner or to use as part of a larger project. Just glue & grout! 5 large floral cut china swags (2.5 inches), 5 smaller cut china tiles (1.25 inches), 1 stunning pink rose cut china focal (cracked in half but reglued and not noticeable. 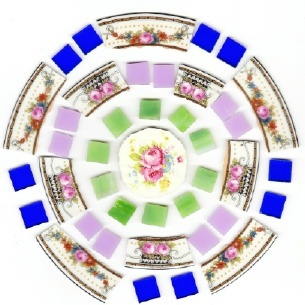 You can easily re-break it if you wish) and 10 each of 1/2 inch cobalt blue, apple green and pale pink stained glass tiles. No crazing except a tiny amount on the focal (barely visible), no discoloration, lay flat. The colors are wonderful together!